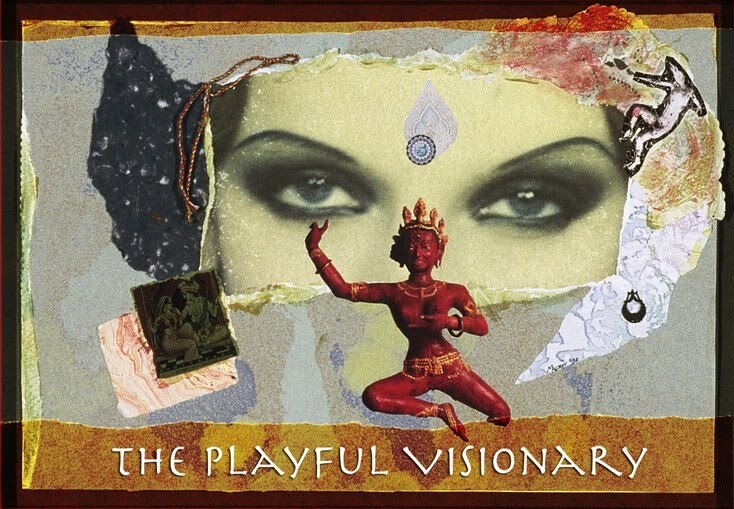 The Playful Visionary can be your Sandbox, Think Tank, Dream Lab and Critic-Free Zone for launching. A virtual palace where Wishes, Dreams and Vision come to life. We make art that serves as a blueprint to bring desires into reality. Vision Boards. Treasure Maps. Seed Cards. Wishing Shrines. Divination tools. Your 3D Glasses to see the future. Just click the flyer to expand. 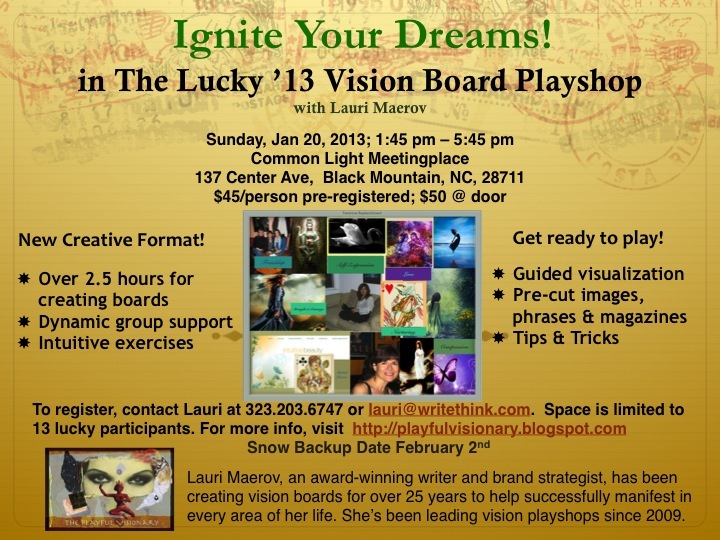 Thirteen lucky visionaries will join me on January 20th. More info coming soon. In case of inclement weather, the snow backup date will be February 2nd. Also called a Dream Board, a Vision Board is a collage of images, words and phrases that create a picture of the goals and dreams you want to attract. The closer your images are to your desired reality, and the more emotional and affirmative the words and sentence fragments you use, the stronger the finished Vision Board's effect will be on you. Look at your finished VB frequently and feel that you embody this new reality with emotion. Be specific in choosing your images. They will come to life in uncanny ways. A variation on the Vision Board, a treasure map is built around a wish or deep desire, so the images and phrases represent elements or steps toward attaining it. Or they can be a visual representation of the desired thing itself, designed to trigger the power of the conscious and unconscious. 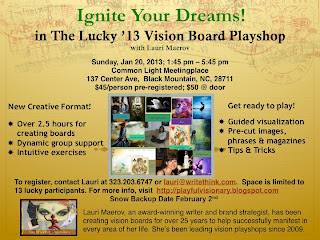 Your Vision Board, Dream Board or Treasure Map collaborates with your written goals and intentions, your visual imagination, your strongly felt emotions – and the actions you take in the world to draw in the power of synchronicity. As you use your Vision Board to create a visual blueprint of your dreams, each day more fortuitous circumstances will occur to bring the right people and connections to you to accelerate your dream coming true. Email lauri[at]writethink[dot]com for more information.